Big names such as Queen and Adam Lambert, Enrique Iglesias, Brian May and Kerry Ellis, and Foreigner are among those that will be on stage in concert in Bulgaria in the first six months of 2016. That’s on the rock and pop front. 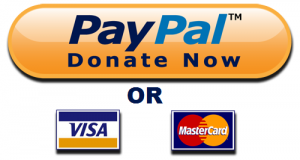 Don’t forget the programmes of the seasons of Sofia Opera and Ballet and Sofia Philharmonic in 2016. January 23, for example, sees a production by Sofia Opera and Ballet of Giuseppe Verdi’s Rigoletto. On February 21, Greek singer Despina Vandi – whose single Ipofero (2000) is the all-time best-selling single in Greece and who, with Gia, became the first-ever Greek singer to top a Billboard chart – will be at the National Palace of Culture, NDK. Tickets, via eventim.bg, cost from 40 to 90 leva. On March 15, Georgia’s Tamar “Tamriko” Gverdtsiteli, whose discography stretches from 1982 to 2009, is at NDK, with tickets costing 40 to 150 leva. She performs in Bourgas on March 17 and in Varna on March 18. 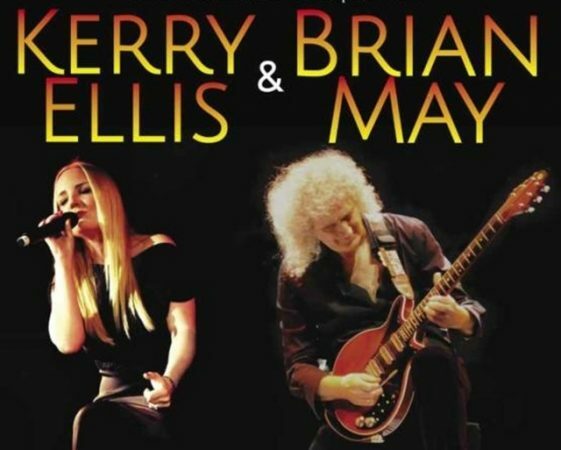 Queen guitarist Brian May and Broadway star Kerry Ellis will be performing at NDK, in Bulgaria’s capital city Sofia on March 16 2016 at 8pm in the venue’s Hall 1. The concert will be part of the programme of the jubilee 20th Sofia Film Fest, organisers Sofia Music Enterprises said. He has worked extensively with English stage actress and singer Kerry Ellis, after he cast her in the musical We Will Rock You. He produced and arranged her debut studio album Anthems (2010), a follow-up to her extended play Wicked in Rock (2008), as well as appearing with Ellis at many public performances – playing guitar alongside her. Tickets cost 50, 60, 70, 80, 100 and 120 and are available via ticketpro.bg. April 9 brings the Sofia Metal Fest 2016 at Universiada Hall in Shipchenski Prohod Street in Sofia. Full details are yet to be announced. April 16 sees the Mirabai Ceiba World Tour 2016 coming to the Independent Theatre (formerly the Modern Theatre) in Vurbitsa Street in Sofia. Mirabai Ceiba consists of guitarist/singer Markus Sieber and singer/harpist/pianist Angelika Baumbach, who have forged a new style of world devotional music blending Gurmukhi mantras from the Kundalini Yoga tradition with original songs in English and Spanish that reflect a Native American influence. Tickets are 35 to 55 leva, via eventim.bg. On April 22, Emir Kusturica and the No Smoking Orchestra are at NDK. Sarajevo-born Kusturica is best-known as a film director, an award-winner for films including Underground, Black Cat, White Cat and Arizona Dream. Tickets cost 50, 60, 80 leva, via eventim.bg. April 24, Lara Fabian is at NDK. The Belgian-Canadian singer has sold more than 20 million records worldwide, making her the best-selling Belgian singer of all time. Tickets are 59 to 149 leva. On May 14, Spanish singer-songwriter Enrique Iglesias is at Arena Armeec, with tickets costing 79 to 149 leva. 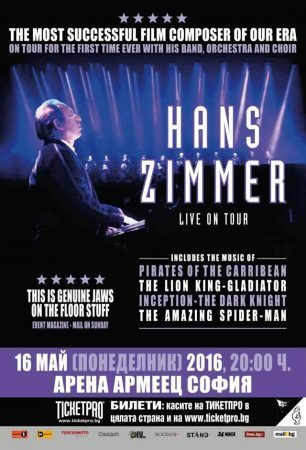 On May 16, film composer Hans Zimmer performs, along with his band, orchestra and choir, at Arena Armeec. The German composer has composed the music for more than 150 films, among them The Lion King, for which he won Academy Award for Best Original Score in 1994, the Pirates of the Caribbean series, The Thin Red Line, Gladiator, The Last Samurai, The Dark Knight Trilogy, Inception, and Interstellar. Tickets via ticketpro.bg, costing 60 to 140 leva. On June 12, British-American hard rock band Foreigner, famed in particular for their hit, “I want to know what love is”, is at Arena Armeec, with tickets costing 60 – 180 leva. 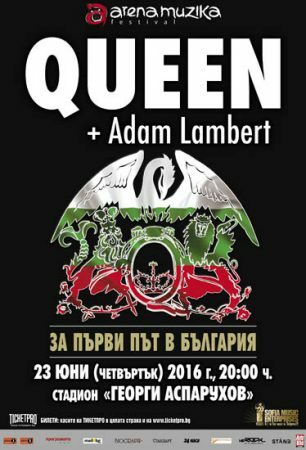 On June 23, Queen and Adam Lambert are at Sofia’s Georgi Asparouhov Stadium. Queen has had a career spanning more than 40 years, amassing a staggering list of sales, awards, and hall of fame inductions. Record sales in the hundreds of millions of units continue to put Queen in the top 10 of all-time iTunes sales, plus seven Ivor Novello Awards, an MTV Global Icon Award, two songs enshrined in the Grammy Hall of Fame – “We Will Rock You” and “We Are the Champions” – which also remain the most played songs at sports events and arenas around the world, make Queen one of rock’s most honoured bands. Adam Lambert, having first appeared together on the 2009 American Idol finale, followed with a performance at the MTV Europe Music Awards, soon became a fixture with Queen, and with the band performed several big concerts and television performances in 2012 and 2013, followed by a fully sold out 24 date US tour in 2014. Lambert’s debut album For Your Entertainment earned him a Grammy Award nomination for Best Male Pop Vocal Performance, and a worldwide smash hit with ‘Whataya Want From Me’. His second album, Trespassing, debuted at No. 1 on the Billboard charts. In 2013, Adam appeared as a guest star on the hit TV series, GLEE and as as a featured vocalist on Avicii’s album ’True’. Adam released his highly anticipated third album, ‘The Original High’ this summer, it entered the worldwide chart at number 3, and took his overall worldwide sales to over 2.5 million. Tickets cost 70 to 140 leva, at all Ticketpro outlets and www.ticketpro.bg.